AED/POUZN and its commercial partners recently began an operations research project in India to determine if rural medical practitioners (RMPs), who treat the vast majority of rural diarrhea cases yet fall outside the formal medical system, would prescribe ORS and zinc treatment in a sustainable manner if approached by medical representatives. 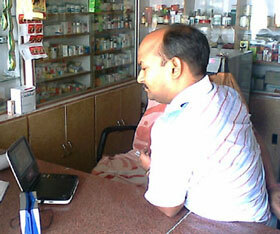 The sales forces of pharmaceutical companies teaming with POUZN, Mapra, Mankind, and Zuventus, initiated the intervention in selected districts of Uttar Pradesh. The project is testing multiple methods for reaching the rural community, including multiple contacts with individual RMPs, reaching RMPs via group meetings at local wholesalers, and implementing interpersonal communications with mothers of small children in selected blocks. The project is using a broad range of communication materials to promote ORS and zinc treatment to RMPs, including brochures, promotional materials, and a video developed in consultation with the USAID Zinc Task Force and shown on mobile DVD players. Prescription and sales progress is quite encouraging, considering early formative research showed that local chemists and wholesalers in these areas did not stock zinc. Within two months, 218 RMPs and 162 chemists (out of 1,362 RMPs and 503 chemists covered in the project) had cumulatively sold 2,401zinc treatments.